Store Championship to coincide with GenCon, except a month later on Spetember 16. Second place gets a foil set of Shenanigans cards. Store credit for top 4. TKc Classic set x2 to be given out as well. Foil alternate art Underrated Superstar for everyone! A Santino BAS card? Where did that one come from? I'd like to update my master list of all known BAS cards, official and unofficial ones. Could I get a scanned copy of the signed card for my files? I know a guy who is in our local wrestling promotion that works with him for Aftermath on Sportsnet. 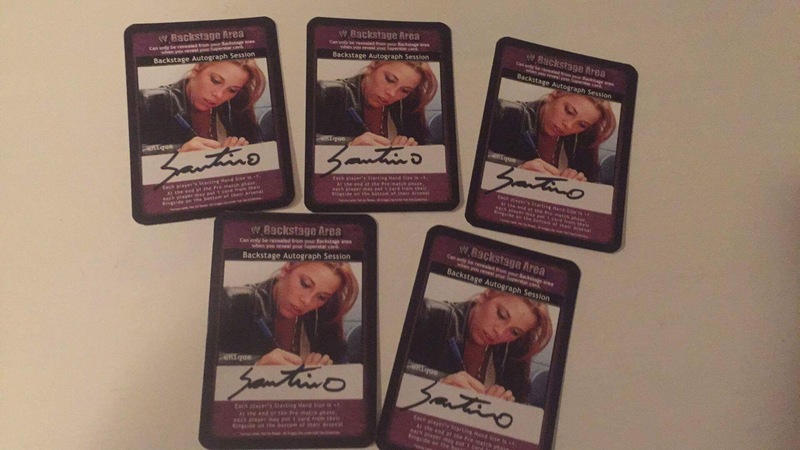 Santino is familiar with the game when it was in its hayday and was more than happy to sign these. Unfortunately I do not have access to a scanner, this is the only photo I have of the cards right now. Once I unpack my prizes I can get you a better photo of a single card if that works. Changed the date due to some scheduling conflicts. Here is a video link of the foil cards for prizing. Printed by keith0913832.